Black Horse Finance was letting a lot of snatchbacks go for sensible money today. 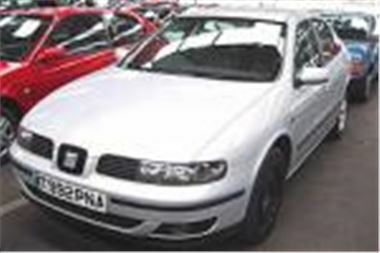 When the 66,000 mile 99T SEAT Toledo TDI 110SE in the photo (complete with 11 stamps in its service book) started bidding at £4,500 even I had my hand in the air. By the time it got to £5,300, I misjudged and got out, only to see it go to the bloke behind me for £5,400. It needed a new tyre, a bit of paint on the valence and a timing belt but was a lot of car for the money. Think that was cheap and there were plenty of other nice surprises in store. A 59,000 mile 2000W Mazda Premacy 1.8Gxi MPV for £4,600, a 60,000 mile 98S Honda Legend 3.5 V6 auto with all the bits bid to £6,575; a 27,000 mile 2001X Volvo 2.4T (200bhp) auto bid to just £11,450; a 34,000 mile 2000W Galant 2.5V6 auto with leather sold for £6,600; an 18,000 mile 2000V Renault Kangoo 1.4RXE Combi sold for £3,925 and, wait for it, a 2000W (didn’t catch the mileage) KIA Clarus 2.0GSX sold for a mere £2,650. Not everything went that way, though. A 23,000 mile 99V Focus 2.0 Ghia in silver with alloys made book at £6,600; a really smart 11,000 mile 2000X Focus 1.8 Zetec with a/c and a bodykit sold for £7,500; a 20,000 mile 2000X Toyota Yaris base model with no PAS sold for £4,800; a spiffed up 41,000 mile 99T Impreza Turbo bid to £9,400; a 9,000 mile 2002/51 reg Renault Clio 1.5 DCI 65bhp Dynamique (the one on £80 VED that does 67mpg) sold for £7,000; and a 7,000 mile 2001/51 Laguna II 2.0i 16v Privilege Sport Tourer sold for a very high £11,850. Fortunately that price paid was put into perspective by the £9,375 that later secured a 1,600 mile 2001Y Laguna 1.9DCI Dynamique Sport Tourer. ‘No sales’ included a 30,000 mile 2000W new shape Volvo V70 140bhp manual estate with a/c bid to £11,000; a magnificent 89,000 mile 97P BMW 740i 4.4 bid to a mere £8,700; a 14,000 mile 2001/51 Citroen Xsara 1.4LX with alloys bid to £5,400; and a 134,000 mile 93L Volvo 960 3.0 24v estate bid to just £700.